It pretty much confirmed that the leaked design from last week where the front-facing camera will pop up from the middle, but similarly to the vivo NEX S.
Although the official unveiling isn't until later this month, there's already a fair amount of information about the V15 Pro and its regular V15 sibling out already. It'll come with a 48-megapixel rear camera and a pop-up camera with 32-megapixels. Vivo V15 Pro is all set to debut on February 20, 2019. Coming to the performance, Vivo V15 pro is expected to be powered by Qualcomm Snapdragon 675 octa-core processor coupled with Adreno 612 GPU. Though Vivo hasn't announced the specifications of the camera, it is believed that the company might employ Samsung's GD 32MP image sensor with HDR and electronic image stabilisation (EIS). Respective specs for each device are now unavailable. Stay tuned for more details on 20th Feb in the afternoon! The upcoming handset was also found to have a 48-megapixel Quad Pixel primary sensor at the back - a part of the triple rear camera setup. Camera performance is obviously the key selling point of the V15 Pro. The page also reveals that the handset will offer an in-display fingerprint sensor. 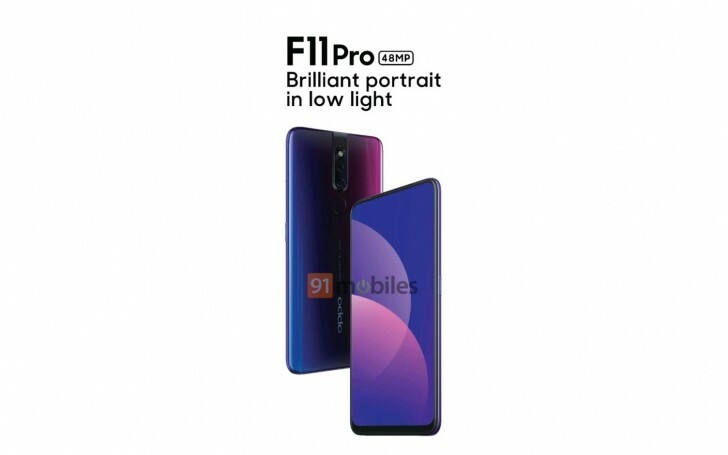 As per the source, the Oppo F11 Pro would feature a MediaTek P70 SoC paired with 6GB of RAM and 128GB of internal storage. The phone will come with a 3,700 mAh battery with "Dual Engine" fast charging.